Advent is the Christian / Catholic preparation for the celebration of the birth of Jesus Christ the Son of God. A four week period – four Sundays / weekend masses before Christmas, a time for renewal and also the beginning of the Church Calender year. 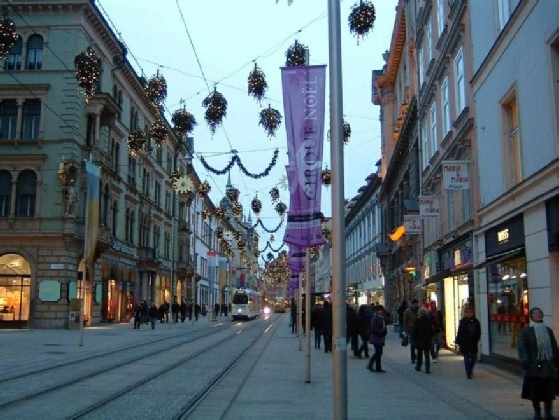 Many Austrians will walk to mid-night mass on Christmas Eve – Heiligend Abend. On Christmas Day the traditional meal is fish not turkey. The Day after Christmas is also a national holiday – Stefanitag- named after the Saint is a day where Austrians visit with family and friends, and take a walk through the wonderful countryside. Austria is steeped in religious tradition and folkculture – this is most noticeable during the Christmas season including many Christmas songs from the religious works of Anton Bruckner to the most famous Christmas carol of all ‘Stille Nacht’ – Silient Night,’ and many others. The countless number of choirs / Chor, bands and orchestras give many memorable performances during this time at Churches – town squares and medieval courtyards, palaces and castles. Are made and can be found in most homes with 4 Kerzen / candles. One is lit each Sunday before Christmas. The first three are purple and the fourth is pink or red. During this time most houses undergo a full cleaning in preparation for the arrival of the Christchild/ Christkind. A full array of Austrian Geback, cookies and pasteries are also prepared and Suessigkeiten/ candies. From Gingerbread/ Lebkucken to Kipferl -half-moon sugar coated shaped cookies. 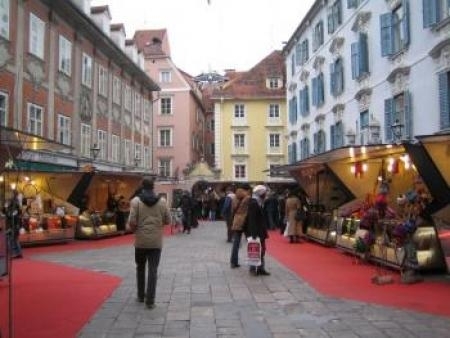 Austria is famous for its Christmas Markets- Weihnachtmarkt. They can be found in the large cities and small towns. 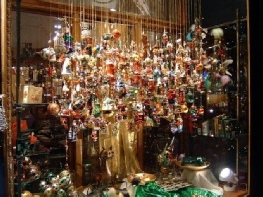 Here one can find many gift ideas of small traditional crafts as well as many sweet temptations. A large to massive sized Alpine Christmas tree/ Weihnachstbaum and Krippe/ manger. 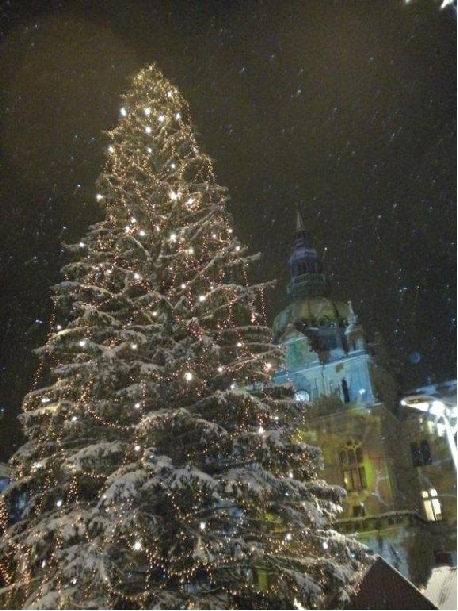 There is always Gluhwein- Mulled wine to enjoy as well as roasted Kastanien / chestnuts! Musical performances are also held at various times, as well as the visit by St. Nikolaus. St. Nikolaus Day– Dec 6th -St.Nikolaus goes around to visit children to ask if they have been good or bad,if they love their parents and siblings and are given candy and small gifts. Sometime – Schwarze Peter will accompany him with a switch and as the story goes – take away the bad kids. Krampus – bad spirits adopted from ancient pagan traditions to chase the winter spirits away. They have fur costumes and with scary masks. Some young men will run through the streets scaring and maybe even swatting those they catch with a switch. Young women they know are usually their object. During Advent trees, shops, city streets and town Squares are decorated in seasonal ornaments, lights and Christmas trees. The merry bustle of the cities and towns with their Christmas Markets fill the streets with cozy wonderful sights, sounds and smells – a warm feeling! Festive scents of punch and toasted almonds, roasted chestnuts, freshly baked apples, plenty of perfect stocking stuffers – gingerbread hearts, nativity figures, tree ornaments, toys and warm woollies. Visiting Austria during this time of year is a Christmas trip you will cherish. Austria was John Denver’s favourite place to be during Advent. The setting of the Austria Alps and culture steeped in the Catholic tradition with the quaint onion domed churches and grand cathedrals, the peeling bells / Glocken, many carols, Christmas Markets with their many stands and outdoor gathering are just a delight to visit – Enjoy!